My kids love a good treasure hunt! 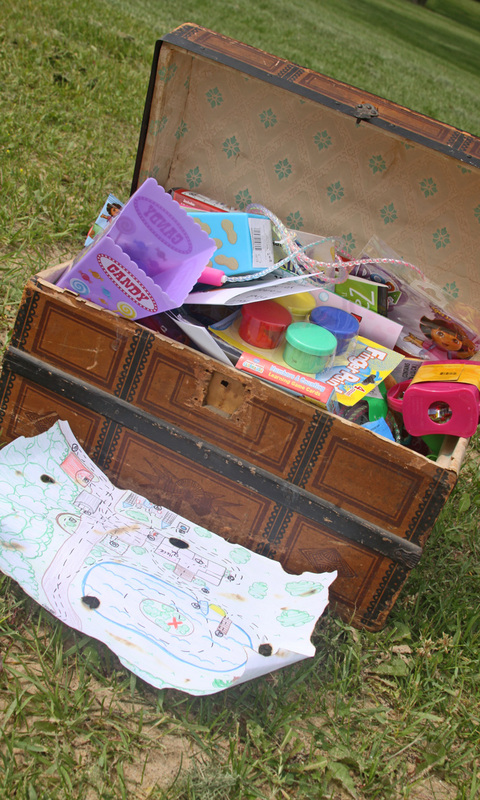 It is a great way to surprise your kids with a fun filled activity that includes hunting for treasure, looking for clues, and following a map along the way. What an inexpensive way to thrill your child at any age! A few simple supplies and a treasure at the end is all you will need for a this super fun family activity. 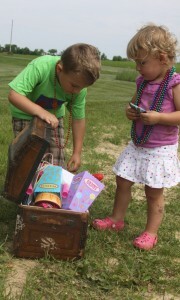 My kids just cannot get enough treasure hunting! We have had three or four in the last couple of years, and they are thrilled to death every single time. It is great for family reunions, birthday parties, get togethers, camping adventure, or just a normal day with a fun activity. We did this during a family camping weekend to entertain the kids with our entire family it was a huge hit. Not only did the kids have a blast but the adults enjoyed following along and enjoying the process too. The first time we did this was last summer. We were celebrating a really special day for our family, and I wanted to make it extra fun and exciting for the kids. It was all about the thrill, the hunt, and the discovery of a pirate treasure planted somewhere at their very own house. I spent some time coloring a map of our property with colored pencil. I made it fun and colorful and highlighted things that they would recognize and see easily. Things like their swing, their power wheel car, and their plastic castle where easy for them to distinguish on the map and find on our property. It was complete with burnt edges and holes, distressed as if it were a real treasure map. 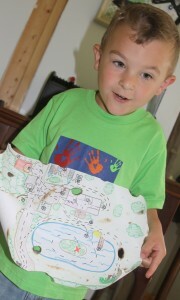 When my son woke up from his afternoon nap he found this treasure map rolled up with a note on the table. It was complete with pirate language (Argggh) and a note stating that a pirate had stopped while he was sleeping and planted a buried treasure somewhere at his house just for him and his little sister. His sister was only two at the time so we let him take the lead and she followed and helped to spot the clues. He was more than thrilled and wide eyed at the site of all of his own things on the colorful map. He could not wait to get started searching for the treasure. The hunt consisted of about 20 clues. It was a lot for kids ages two and four, but we wanted it to last a while, so we could enjoy the time walking around the property as a family. 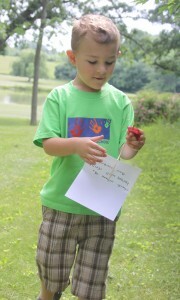 Younger kids may loose interest after more than 10 clues, but our kids really enjoyed the process. The back of the map included the first clue and the other 18 clues (and one treasure) were hidden around the property, in the house and garage. 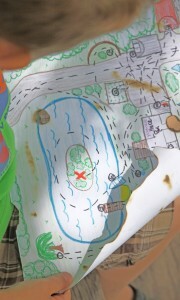 Each clue was also numbered on the map with a trail that the kids were to follow. It was a great way to help them keep track of what clue we were on, and my son loved carrying his map and counting down the clues as he found them. Each clue was placed around our house on a piece of card stock folded in half. 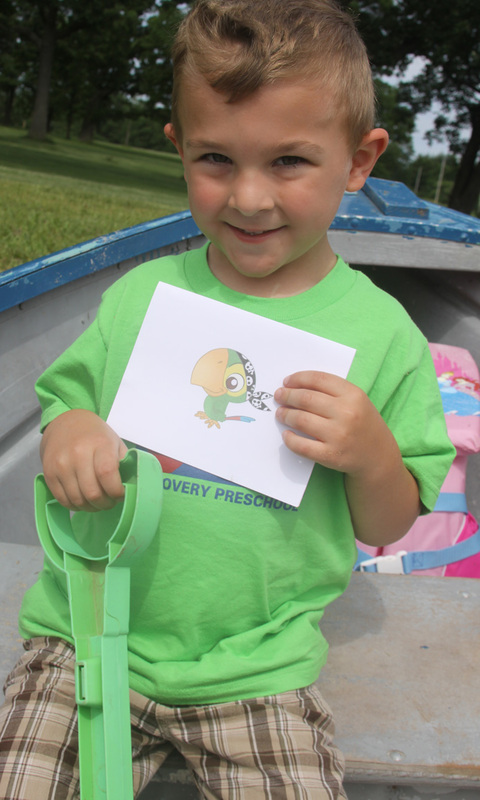 The front had a little pirate bird on it and contained a hint as to where the next clue was hiding. I used wooden cooking skewers to poke holes through the card and push it into the ground in it’s hiding spot. That way the clues were visible from a little bit of a distance and the kids didn’t have to really search for it. If you have older kids it would be fun to really hide the clues well so they have to try a little harder to find it. When I put together a treasure hunt I first write out all of my clues and print my clue cards (in this case with the pirate parrot). Then I number each hint and clue card accordingly. I put a post-it on each card with where it needs to be hidden and then prepare all of the cards on the sticks. That way it is all set to go on the day I need it. All I have to do is take my stack of cards and place them where the note tells me right before the treasure hunt begins. I hide the treasure and wait for the fun to begin. I love that I can just enjoy watching them go on the treasure hunt and not have to worry about whether things are in the right spot, or if a clue got misplaced, or numbered wrong. Spending a short amount of time organizing and preparing, makes it a simple and fun to put together. The kids had a blast going from clue to clue, and did a great job of taking turns. My favorite part was that my son (at 4) really believed that a real pirate had come and left a treasure for him, so when he got to the first clue he was a little nervous about grabbing it. Not sure if he though a pirate was going to be hiding behind the tree, or what, but he sent his 2 year old sister in after it! After he saw that it was okay – he was happy to grab the next few clues on his own. The hunt lasted us a good hour because we really took our time and enjoyed the it! What a great way to spend some time together as a family, and watch the kids enjoy themselves. Their prizes were mostly from the dollar store and didn’t cost a lot, but thrilled them to pieces. 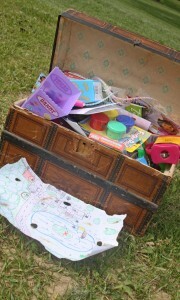 The treasure can be as small or as elaborate as you like, and changed to fit your child’s ages and interests. They talked about it for weeks, and I was so pleased with how special it made our day together. I think it has very little to do with what treasure they find and is more about the thought of thrilling your kids. Sometimes it really is the little things that we remember most, making an effort, and spending time together. It takes very little time and energy to do something unexpected for your kids that is pure magic in their eyes. Watching them enjoy something out of the ordinary touched my heart and I hope it is something that they will always remember and that it provides them with great childhood memories. This is so cute! 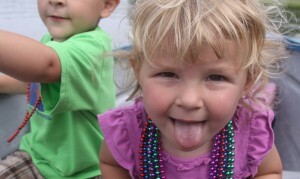 I can’t wait to do this with my 6 and 4 year old to celebrate the beginning of summer. Plus they love Jake and the Neverland pirates.